Save your health and enjoy clean, pure drinking water at home or your office. Protect your appliances, dishes and YOU from hard water damage with water softening systems. Fast, friendly water delivery to your home or office! Sol Wave has a clean water solution for everyone whether you live in Ventura, Carpinteria, Montecito, Santa Barbara or Goleta we can help you with the best service and solution to your needs. 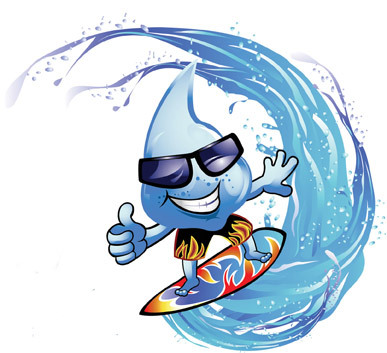 Sol Wave water creates systems for the hard water of the Central Coast from Ventura through Santa Ynez. Sol Wave Water offers home delivery for bottled water. No need to settle for Arrowhead or Sparkletts. Santa Barbara, Ventura, Oxnard, and Central Coast, have some of the hardest water in the nation. Sol Wave can help. Sol Wave Water designs and installs high capacity water treatment systems for business and industry. Sol Wave has a Clean Water Solution for you. We offer advanced filtration and reverse osmosis systems. Chlorine is the primary cause of bad taste and odor in drinking water. No more lugging heavy bags from the grocery store, to your car, to your softener. *Buy a Sol Wave H.E. Water Softener and Drinking Water System and get $300 off the package. We will match any advertised special offer by any reputable company including Culligan Santa Barbara (actually Culligan Ventura) in our area. Our Specialties are water softeners, 1 to 1 high efficiency reverse osmosis systems, salt-free systems, whole home chlorine removal, drinking water filter systems, sodium chloride and potassium chloride delivery, fixing water softeners, upgrading old filters to high efficiency, 5 gallon bottle delivery, 5 gallon glass bottle delivery. We are service to Santa Barbara, Montecito, Carpinteria, Hope Ranch, Goleta, Gaviota, Santa Ynez, Solvang, Los Olivos, Los Alamos, El Capitan, Mesa, Mission Canyon, and to the south, Malibu, Calabasas, Agoura & Agoura Hills, Thousand Oaks, Simi Valley, Moorpark, Somis, Camarillo, Oxnard, Ventura, Santa Paula, Ojai, Oak View, La Conchita and Rincon.